Akbarzade, K., Danaee, I. (2018). Nyquist Plots Prediction Using Neural Networks in Corrosion Inhibition of Steel by Schiff Base. Iranian Journal of Chemistry and Chemical Engineering (IJCCE), 37(3), 135-143. Kazem Akbarzade; Iman Danaee. "Nyquist Plots Prediction Using Neural Networks in Corrosion Inhibition of Steel by Schiff Base". 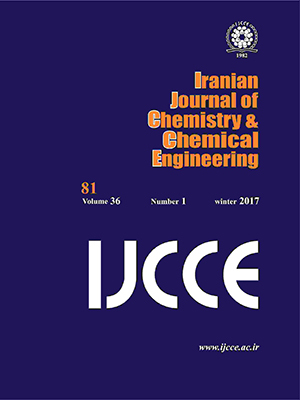 Iranian Journal of Chemistry and Chemical Engineering (IJCCE), 37, 3, 2018, 135-143. Akbarzade, K., Danaee, I. (2018). 'Nyquist Plots Prediction Using Neural Networks in Corrosion Inhibition of Steel by Schiff Base', Iranian Journal of Chemistry and Chemical Engineering (IJCCE), 37(3), pp. 135-143. Akbarzade, K., Danaee, I. Nyquist Plots Prediction Using Neural Networks in Corrosion Inhibition of Steel by Schiff Base. Iranian Journal of Chemistry and Chemical Engineering (IJCCE), 2018; 37(3): 135-143. The corrosion inhibition effect of N,N′-bis(n-Hydroxybenzaldehyde)-1,3-Propandiimine on mild steel has been investigated in 1 M HCl using electrochemical impedance spectroscopy. A predictive model was presented for Nyquist plots using an artificial neural network. The proposed model predicted the imaginary impedance based on the real part of the impedance as a function of time. The model took into account the variations of the real impedance and immersion time of steel in a corrosive environment, considering constant corrosion inhibitor concentrations. The best-fit training data set was obtained with eleven neurons in the hidden layer for Schiff base inhibitor, which made it possible to predict the efficiency. On the validation data set, simulations and experimental data test were in good agreement. The developed model can be used for the prediction of the real and imaginary parts of the impedance as a function of time. Hegazy M.A., Aiad I., 1-Dodecyl-4-(((3-Morpholinopropyl)imino)methyl)pyridin -1- Ium Bromide as a Novel Corrosion Inhibitor for Carbon Steel During Phosphoric Acid Production, J. Ind. Eng. Chem. 31: 91-99 (2015). Shabani-Nooshabadi M., Ghandchi M.S., Santolina Chamaecyparissus Extract as a Natural Source Inhibitor for 304 Stainless Steel Corrosion in 3.5% NaCl, J. Ind. Eng. Chem. 31: 231-237 (2015). Hoseinzadeh A.R., Danaee I., Maddahy, M.H., RashvandAvei, M., Taurine as a Green Corrosion Inhibitor for AISI 4130 Steel Alloy in Hydrochloric Acid Solution. Chem. Eng. Comm., 201: 380-402 (2014). ChaitraT.K., Mohana K.N.S., Tandon H.C., Thermodynamic, Electrochemical and Quantum Chemical Evaluation of Some Triazole Schiff Bases as Mild Steel Corrosion Inhibitors in Acid Media, J. Mol. Liq., 211: 1026-1038 (2015). Verma C., Ebenso E.E., Bahadur I., Obot I.B., Quraishi M.A., 5-(Phenylthio)-3H-pyrrole-4-Carbonitriles as Effective Corrosion Inhibitors for Mild Steel in 1 M HCl: Experimental and Theoretical Investigation, J. Mol. Liq., 212: 209-218 (2015). Park J.K., Jeong N.H., Corrosion Inhibition Effect of Ester Containing Cationic Gemini Surfactants on Low Carbon Steel, Iran. J. Chem. Chem. Eng. (IJCCE), 35: 85-93 (2016). Abderrahim K., Abderrahmane S., Millet J.P., Inhibition of Copper Corrosion by Ethanolamine in 100 ppm NaCl, Iran. J. Chem. Chem. Eng. (IJCCE) 35: 89-98 (2016). Gholami M., Danaee I., Maddahy M.H., RashvandAvei M., Correlated ab Initio and Electroanalytical Study on Inhibition Behavior of 2‑Mercaptobenzothiazole and Its Thiole−Thione Tautomerism Effect for the Corrosion of Steel (API 5L X52) in Sulphuric Acid Solution. Ind. Eng. Chem. Res. 52: 14875−14889 (2013). Danaee I., Ghasemi O., Rashed G. R., RashvandAvei M., Maddahy M.H., Effect of Hydroxyl Group Position on Adsorption Behavior and Corrosion Inhibition of Hydroxybenzaldehyde Schiff Bases: Electrochemical and Quantum Calculations. J. Mol. Struct. 1035, 247-259 (2013). Balaji J., Sethuraman M.G., Corrosion Protection of Copper with Hybrid Sol-Gel Containing 1H-1, 2, 4-triazole-3-thiol, Iran. J. Chem. Chem. Eng. (IJCCE) 35: 61-71 (2016). Ghasemi O., Danaee I., Rashed G.R., RashvandAvei M., Maddahy M.H., Inhibition effect of a synthesized N, N′-bis(2-hydroxybenzaldehyde)-1, 3-propandiimine on Corrosion of Mild Steel in HCl. J. Cent. South Univ. 20: 301-311 (2013). Dasami P.M., Parameswari K., Chitra S., Corrosion Inhibition of Mild Steel in 1 M H2SO4 by Thiadiazole Schiff Bases, Measurement, 69: 195-201 (2015). Jafari H., Danaee I. Eskandari H., RashvandAvei M., Electrochemical and Theoretical Studies of Adsorption and Corrosion Inhibition of N,N′-Bis(2-hydroxyethoxyacetophenone) -2,2-dimethyl -1,2-propanediimine on Low Carbon Steel (API 5L Grade B) in Acidic Solution. Ind. Eng. Chem. Res., 52: 6617-6632 (2013). Saha S. K., Ghosh P., Hens A., Murmu N.C., Banerjee P., Density Functional Theory and Molecular Dynamics Simulation Study on Corrosion Inhibition Performance of Mild Steel by Mercapto-Quinoline Schiff Base Corrosion Inhibitor, Physica E, 66: 332-341 (2015). Colorado-Garrido D., Serna S., Cruz-Chávez M., Hernández J.A., Campillo B., Artificial Neural Networks for Electrochemical Impedance Spectroscopy Sour Corrosion Predictions of Nano-modified Microalloyed Steels, Electronics, Robotics and Automotive Mechanics Conference, 210: 185-190 (2010). Silva C.D.L.D., Junior G.C., Morais A.P.D., Marchesan G., Guarda F.G.K., A Continually Online Trained Impedance Estimation Algorithm for Transmission Line Distance Protection Tolerant to System Frequency Deviation, Electr. Pow. Syst. Res. 147: 73-80 (2017). Conesa C., Sánchez L.G., Seguí L., Fito P., Laguarda-Miró N., Ethanol Quantification in Pineapple Waste by an Electrochemical Impedance Spectroscopy-Based System and Artificial Neural Networks, Chemometr. Intell. Lab. 161: 1-7 (2017). Ghanadzadeh H., Daghbandan A., Akbarizadeh M., Applying Pareto Design of GMDH-Type Neural Network for Solid-Liquid Equilibrium of Binary Systems (Isotactic Poly 1-Butene (1)-Organic Solvents (2)), Iran. J. Chem. Chem. Eng. (IJCCE), 33: 67-73 (2014). Ehsani M.R., Bateni H., Razi Parchikolaei G., Modeling of Oxidative Coupling of Methane over Mn/Na2WO4/SiO2 Catalyst Using Artificial Neural Network, Iran. J. Chem. Chem. Eng. (IJCCE), 32: 107-114 (2013). Ahmmed I.S., Mohamed H.A., Nayef G.M., Decentralized Advanced Model Predictive Controller of Fluidized-Bed for Polymerization Process, Iran. J. Chem. Chem. Eng. (IJCCE), 31: 91-117 (2012). Azari A., Shariaty-Niassar M., Alborzi M., Short-term and Medium-term Gas Demand Load Forecasting by Neural Networks, Iran. J. Chem. Chem. Eng. (IJCCE), 31: 77-84 (2012). Magharei A., Vahabzadeh F., Sohrabi M., Rahimi Kashkouli Y., Maleki M., Mixture of Xylose and Glucose Affects Xylitol Production by Pichia guilliermondii: Model Prediction Using Artificial Neural Network, Iran. J. Chem. Chem. Eng. (IJCCE), 31: 119-131 (2012). Abbasi M., Soleymani A.R., Parssa J.B., Operation Simulation of a Recycled Electrochemical Ozone Generator Using Artificial Neural Network, Chem. Eng. Res. Des., 92: 2618-2625 (2014). Chen F.F., Breedon M., White P., Chu C., Mallick D., Thomas S., Sapper E., Cole I., Correlation between Molecular Features and Electrochemical Properties Using an Artificial Neural Network, Mater. Des. 112: 410-418 (2016). Panchal I., Sawhney I.K., Sharma A.K., Dang A.K., Classification of Healthy and Mastitis Murrah Buffaloes by Application of Neural Network Models Using Yield and Milk Quality Parameters, Comput. Electron. Agr. 127: 242-248 (2016). Rolich T., Rezic I., Curkovic L., Estimation of Steel Guitar Strings Corrosion by Artificial Neural Network, Corros. Sci. 52: 996-1002 (2010). Sun Y., Chen Y., Yuan Y., Wang G., Dynamic Adjustment of Hidden Layer Structure for Convex Incremental Extreme Learning Machine, Neurocomputing, 261: 83-93 (2017). Yang Z.X., Zhao G.H., Rong H.J., Yang J., Adaptive Backstepping Control for Magnetic Bearing System via Feedforward Networks with Random Hidden Nodes, Neurocomputing 174: 109-120 (2016). Matias T., Souza F., Araújo R., Antunes C.H., Learning of a Single-Hidden Layer Feedforward Neural Network Using an Optimized Extreme Learning Machine, Neurocomputing 129: 428-436 (2014). Jafari H., Danaee I., Eskandari H., RashvandAvei M., Combined Computational and Experimental Study on the Adsorption and Inhibition Effects of N2O2 Schiff Base on the Corrosion of API 5L Grade B Steel in 1 mol/L HCl, J. Mater. Sci. Technol., 30: 239-252 (2014). Danaee I., Kinetics and Mechanism of Palladium Electrodeposition on Graphite Electrode by Impedance and Noise Measurements, J. Electroanal. Chem., 662: 415–420 (2011). Macdonald J.R., Note on the Parameterization of the Constant Phase Admittance Element. Solid State Ion., 13: 147–149 (1984). Hoseinzadeh A.R., Danaee I., Maddahy M.H., Thermodynamic and Adsorption Behaviour of Vitamin B1 as a Corrosion Inhibitor for AISI 4130 Steel Alloy in HCl Solution, Z. Phys. Chem., 227: 403-417 (2013). RameshKumar S., Danaee I., RashvandAvei M., Vijayan M., Quantum Chemical and Experimental Investigations on Equipotent Effects of (+)R and (−)S Enantiomers of Racemic Amisulpride as Eco-Friendly Corrosion Inhibitors for Mild steel in Acidic Solution, J. Mol. Liq., 212: 168-186 (2015). Danaee I., Niknejad Khomami M., Attar A.A., Corrosion Behavior of AISI 4130 Steel Alloy in Ethylene Glycol–Water Mixture in Presence of Molybdate, Mater. Chem. Phys., 135: 658–667 (2012). Martin O., De Tiedra P., Lopez M., Artificial Neural Networks for Pitting Potential Prediction of Resistance Spot Welding Joints of AISI 304 Austenitic Stainless Steel, Corros. Sci. 52: 2397-2402 (2010). Ramana K.V.S., Anita T., Mandal S., Kaliappan S., Shaikh H., Sivaprasad P.V., Dayal, R.K., Khatak H.S., Effect of Different Environmental Parameters on Pitting Behavior of AISI Type 316L Stainless Steel: Experimental Studies and Neural Network Modeling, Mater. Des., 30: 3770-3775 (2009). Khadom A.A., Modeling of Corrosion Reaction Data in Inhibited Acid Environment Using Regressions and Artificial Neural Networks, Korean J. Chem. Eng., 30, 2197-2204 (2013).